Many of my best memories of high school come from experiences on speech team. There are the crystal clear memories: scanning elimination lists, late-night dinners at Denny’s, my shock at winning my first ever tournament, and an incident mid-round involving my best friend/duo interpretation partner and a pair of pantyhose. There are also the fuzzier images: the judge with the pig tie, the record store near UC Berkley, the always cold classrooms. Some years later, when I was a teacher, I chaperoned the speech team on a weekend invitational tournament. That experience was not nearly as fun but my respect and admiration for my coach and moderator increased exponentially (Kristi Balleweg and Eileen DeBruno are forever my heroes!). 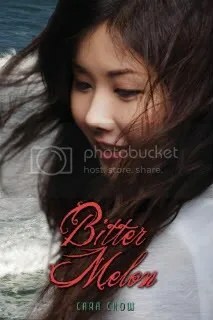 All these memories came back to me in a rush when I read Bitter Melon by Cara Chow. The main character, Frances Ching, attends an all-girls prep school and joins the speech team at her teacher’s encouragement. A former “speechie” herself, the author does an excellent job describing how it feels to enter an unfamiliar classroom, select a seat, size up the judge, psych out the competition. Chow gets the roller coaster of nervousness and confidence just right. And the trophy! The brassy, hollow treasure that means both everything and nothing. But Bitter Melon offers up more than just a glimpse into the geeky world of high school speech and debate. The novel is as good as any Amy Tan book for its exploration of mother/daughter relationships and themes of loyalty to self and family. Because the story is set in the 1989-1990 school year, there’s no internet or texting for these teens. Frances and her peers pass notes on paper and share corded wall phones with their parents. They also use AquaNet and the President Bush they refer to isn’t W. The only period detail Chow is missing is the DJ spinning “My Prerogative” or “Straight Up” at one of the dances. This is a great read for present day teens or for a child of the 80s. Looking forward to more from this debut author! Summary: Gracie Ching wants her only daughter, Frances, to attend UC Berkley and then go on to medical school. Gracie works long hours at a low-paying job to afford tuition at a private girls school and she has Frances’ entire academic future planned out. Now in her senior year, Frances has grown tired of her mother’s unrelenting pressure so when she accidentally enrolls in speech instead of AP Calculus, she doesn’t bother to change classes. In fact, Frances kind of likes speech. And her teacher, Ms. Taylor assures her she’s good at it. At Ms. Taylor’s encouragement and with help on the homefront from fellow overachiever Theresa, Frances begins to find her own voice. But will Gracie listen to what her daughter has to say?